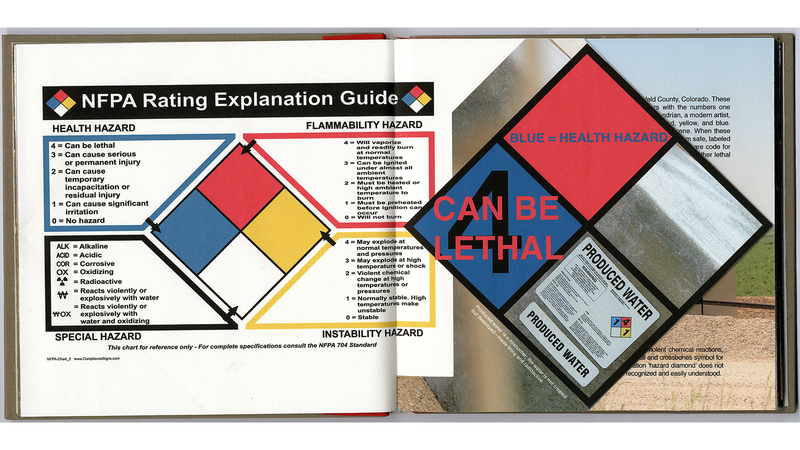 Kathy Hettinga has long been interested in putting text and image together, from published photobooks to artist’s books. Hettinga states- “My love affair with the pixel is longstanding. 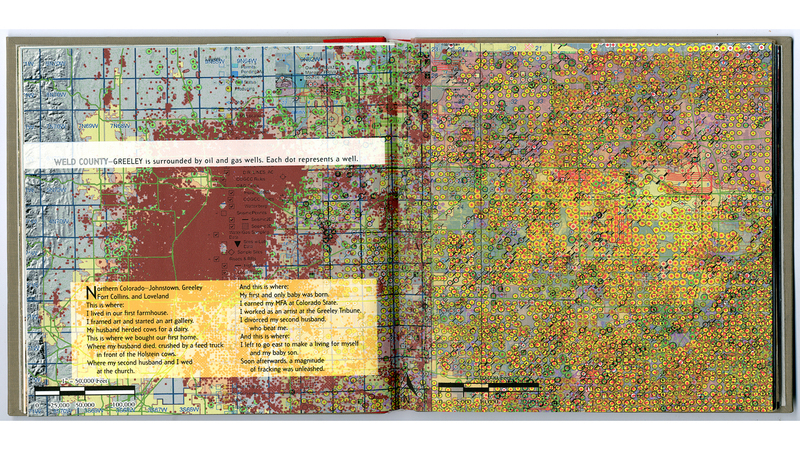 4 3 2 CRY brings together—satellite mapping, oil/gas mapping, digital photography, Wacom drawing, design, hand binding, and more to create the structural whole—an artist’s book”. 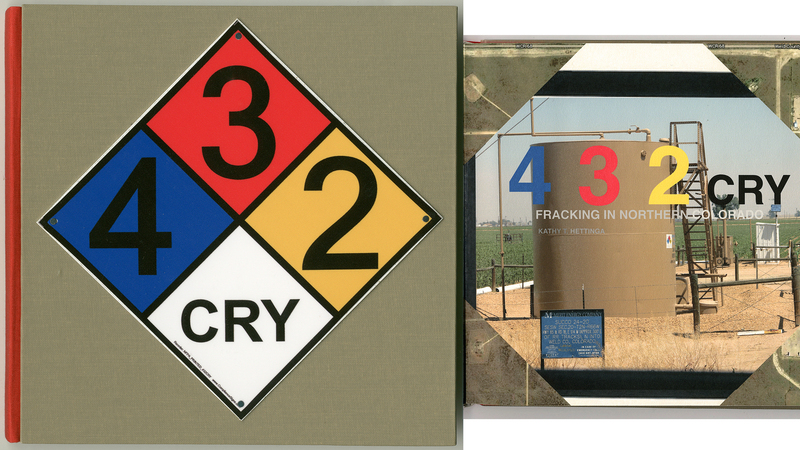 4 3 2 CRY mediates parallel narratives of personal and environmental loss, exposing the effects of hydraulic fracturing for oil and gas upon families, land, air and water. It is a lament and a goodbye for the material/physical place that Hettinga dearly loved in Northern Colorado. 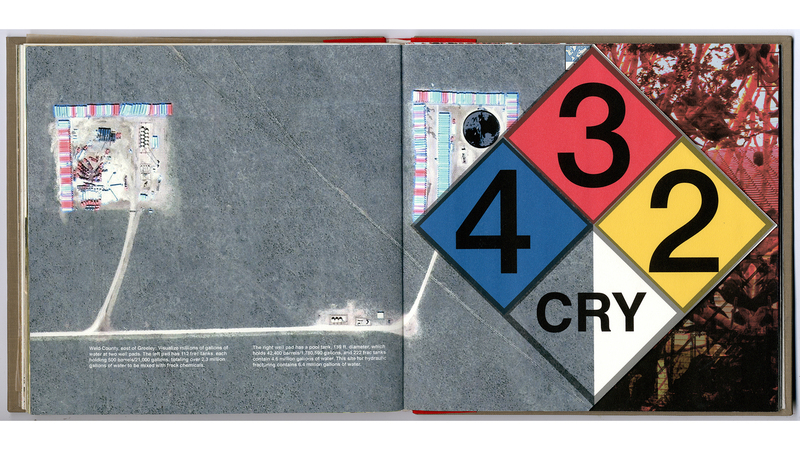 4 3 2 CRY was created at Women’s Studio Workshop and made possible by an Artist’s Book Residency Grant. Media: Aluminum compliance sign riveted to cover; Arrestox cloth covered book boards; Cialux cloth covered spine; Archival ink on Mohawk Superfine, eggshell, 70 lb. text. Fonts: Helvetica, Helvetica Neue, and Arbitrary. Digital mapping, photography, scanning and drawing; Adobe Creative Cloud.